Well, the beast if finally here. After having driven a 1991 Chevy extended cab shortbox half-ton pickup for six years, I decided to take the plunge and move up to a large truck. 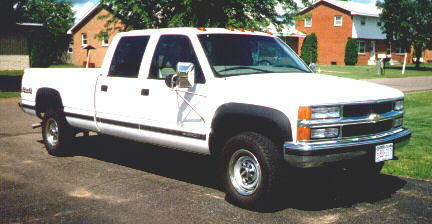 I placed an order with my dealer for a 1997 4X4 crewcab pickup. Hey, nothing like thinking big. I picked exactly what I wanted on the truck using Edmunds online vehicle option lists and their online pricing guides. Kelly Blue Book also offers vehicle pricing guides. Both sites appear to agree of the invoice prices of the vehicles I looked at. Kelly Blue Book lays out the information in a different format that makes it easier to looks at the options that you want. This got me exactly what I wanted and using their buying tips, I got it at the invoice price without a problem. Ordering a vehicle straight from the factory is the best way to get exactly what you want without unneccesary options. Here is the list of options that I selected for my truck. These are some of the specifications of my truck. With the purchase of a new truck, that means it is time to start adding a few accessories onto the vehicle that don't come with the truck. Well, seeing as how I have that urge to add-on some items, let the project begin. The build up of my truck will be in a couple of stages. Stage One will be pretty simple additions, partially cosmetic, but also some useful items to increase the overall usefullness of the vehicle. When I am done, I expect my truck to resemble this. Ok, maybe that won't ever happen. In the meantime, I'll have to start a bit smaller. Here is a list of things that I have added and also some of the tools and equipment I always keep in my truck. Since delivery, I have added a Delta crossbed toolbox. It is a great way to get all the junk out of the cab from under the seats. My only beef with the toolbox is the piece of crap paint job that it has. Three months after purchase it started rusting out. I'm going to have to pull the toolbox and sand it and paint it some time soon. The stock tires finally started to wear out at around 35K miles. One of the tire/rim combinations doesn't hold air real well and I wanted bigger tires anyways, so I ordered a set of BFGoodrich All Terrain KO's in a size of 285/75R16 on American Eagle 589 16x8 rims from 4Wheel Parts Wholesalers. The wheels and tires come all mounted and balanced and includes lugnuts, just add air to bring up to the load rating. These tires are not exactly a no brain install. I had to use the sawzall to trim off the corners of the front bumper and the backs of the front wheelwells. This gives enough room for normal operation. There is still some rubbing at the back of the wheel wells during the compression cycle while turning, but just against the fender well liner. I can live with that. I did crank the front torsion bars up about half an inch for some static clearance. That thing is huge -- It's not even 21 feet long. Does it fit in your garage? -- Yes, but just barely. Four doors? -- Why not, some trucks already have three.